flexiblegrouping | Dude, Where's My Shelfwork? In one of my earlier posts, I talked about table jobs and folders. First, I will introduce the inspiration for our table “mascots”. 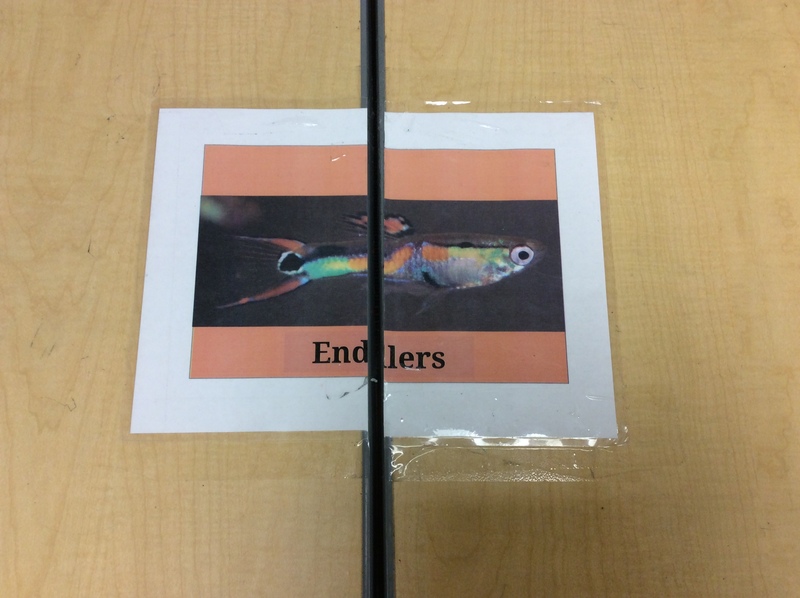 We have two fish tanks is our classroom, post on those later, and the tables have a species of fish pictured on them. I have found that having a “mascot” has more of a team building effect than numbering the tables. It also helps us organize for other things in the room such as the table jobs and folders. The signs are cut in half so that when tables get rearranged in the room they can get reunited correctly when we restore the environment. Fish signs we have are: Endler Guppies, Neon Tetras, Long-fin Blue Danios, Ramshorn Snails, Giant Khuli Loaches, Celestial Pearl Danios (CPDs), and Rachovii Killifish. Most of the fish that I use for table “mascots” are ones that are in our classroom tanks, or that I have at home. I have the CPDs at home, they are too expensive to have at school and they are skittish so not as much fun to watch. There is only one fish that I don’t have either place because they only live for about 3 months, so if you can’t get them to reproduce, they are very heartbreaking. We tried, unsuccessfully, to hatch some rachovii at home last year. Frustrating. They are very beautiful and colorful, so they seemed appropriate for a Montessori classroom table. 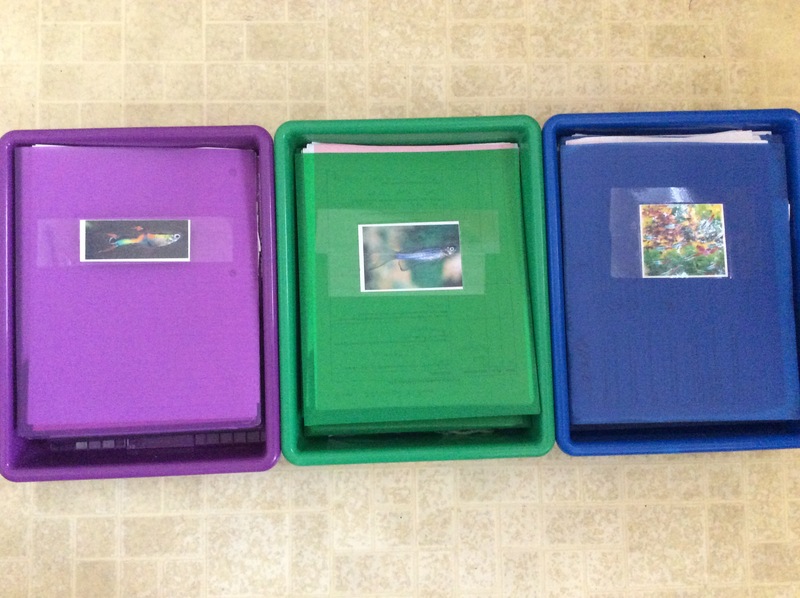 Bins with the table folders for each class period in them. To coordinate with the tables, each class period has a color of folder and each table has a folder that matches their fish. I can’t rave about this enough. ALL work that is turned in to me on paper goes in the table folder where students sit. Post on this to come. 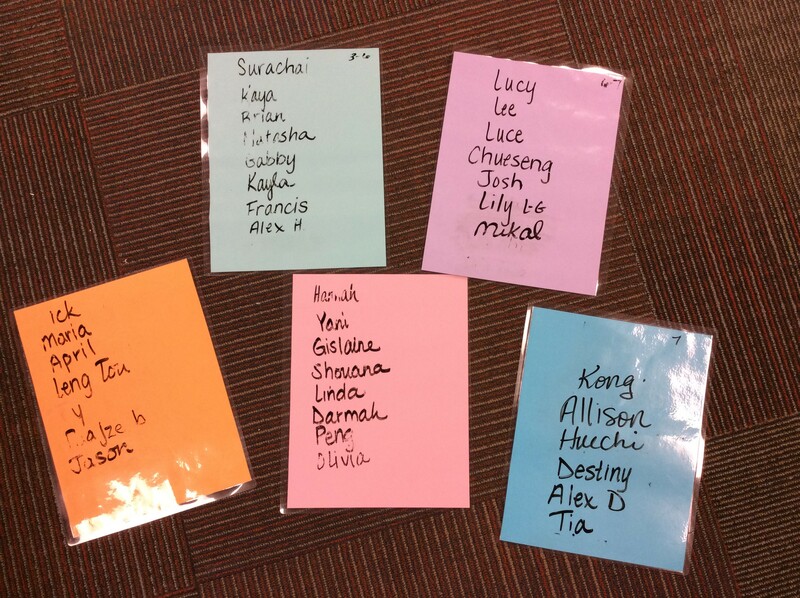 Another way that I group students for just the day, or alternative activities such as Literature Circles, is to create signs with students’ names on them. I just laminated different colors of printer paper and use either a dry erase marker or overhead marker to write the names of the students on the sheets. I intend to remake some so that each is a different color, these just happened to be the colors in the copy room the day that I needed to make them. I still have students turn in work to their original table folders to save confusion for all of us. This allows for flexible grouping (big buzz phrase right now), which is great for Montessori classrooms since we are 6-8th grades mixed in one class. Since the ability ranges in my students have nothing to do with their grade level, and students might have different levels depending on the skill (great at main idea, bad at compare/contrast), this allows me to regroup depending on the activity or skill we are working on. Do you have great ways to group students? Please share in the comments! Categories: Procedures | Tags: classroomorganization, flexiblegrouping, middleschool, montessori | Permalink.